Last year when Dynon released version 14 of the SkyView software one of the new features added was the ability for the SkyView to display custom made checklists for the aircraft. The process of taking advantage of SkyView’s capability to display customized checklists in the DOG Aviation RV-12 began last winter … but never quite got the lists to my liking at that time, so put the project on the back burner through the summer months. During the latest batch of cold/ rainy/windy/low ceiling days here in northeast Ohio, figured it was about time that I finished off the checklists and tweak them to what I feel is a usable format … even one a pilot barely familiar with the RV-12 could safely use. 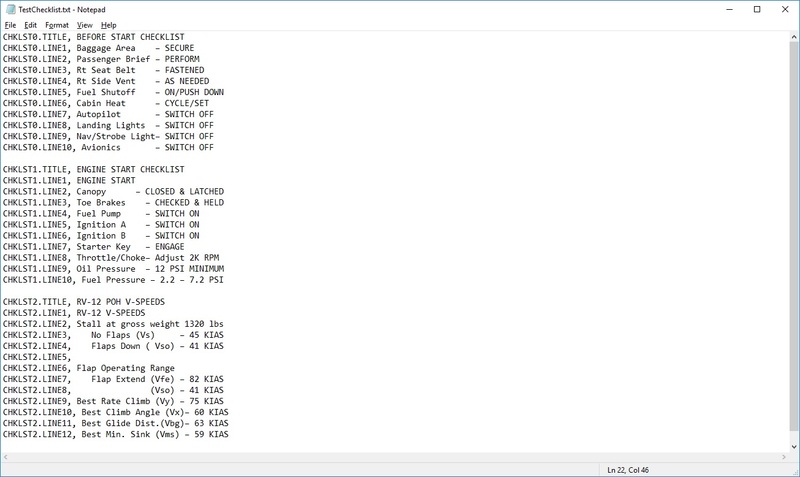 Now that the text editing is more or less completed, I’ve decided to share my individual checklists with others so they can use the lists to quickly build a RV-12 checklist as is, or modify my lists to suit their needs and personal taste. 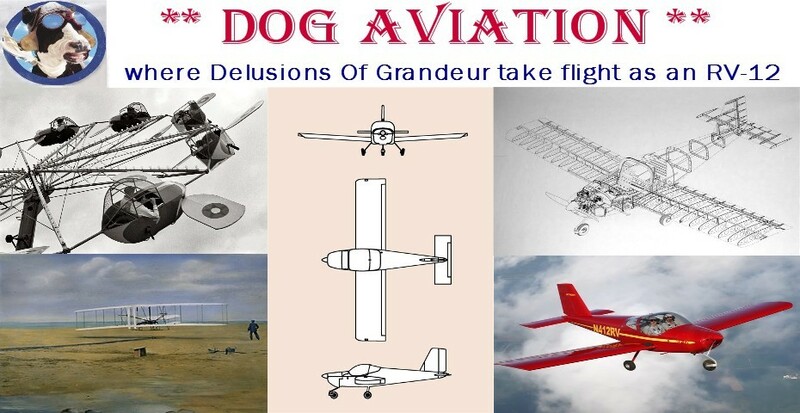 In addition to various checklists, there are also emergency checklists, RV-12 specific specifications and miscellaneous information that may come in handy at some point. With a little custom editing the text lists posted in Parts 3-7 could easily be adapted to aircraft other than the RV-12. Part 1: Becoming acquainted with the checklist file. 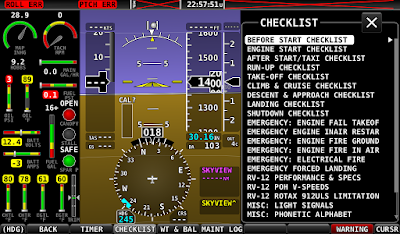 The checklist file that will be loaded into the SkyView is created on a computer either manually using a simple text editor or by using Dynon’s checklist creation tool. Rather than installing a separate file for each checklist desired, Dynon uses only one checklist file. Think of it as a “master” file which contains all the separate checklists the user wants the SkyView to display. The “master” checklist file has a unique internal format that once carefully looked at, I think most will have no problems creating or editing the file. I’ll show abbreviated examples of the contents of the checklist file which will allow the viewer to see the internal format the checklist file utilizes. There are some limitations and also a learning curve involved especially when creating the checklist file by hand. The display screen size governs the limit for the number of text characters that can be displayed on each line of the checklist. A 40% display page limits text to 31 characters per line and a 50% display page limits text to 40 characters per line. There is no wraparound … so lines of text longer than the limits are just cut off and simply not displayed. Creating the checklist file manually: (Using Dynon's Excel-based checklist creator tool will be covered in Part8). Creating checklists manually involves the user creating a text file using a computer. The text file will contain all the multiple checklists the user wants the SkyView to display along with titles for each checklist. On a Windows computer the checklist text file can be created using a simple text editor such as “Notepad” (can be found under Windows Accessories in the program list). When finished entering the text for ALL the individual checklists and making sure the Dynon format for each line of text is adhered to, the user needs to save the text as a plain text file with a .txt file extension. One such example would be saving the file as rv12checklist.txt making sure there are no spaces in the file name. For those of you Big Mac types (Apple) “TextEdit” is used to generate the text file along with selecting “UTF-8 Character Encoding” before saving the file. Here again, name the file … nameofyourchoice.txt. Below is an example of a test checklist file I made for the reader that has three abbreviated checklists. One can easily see the format used by Dynon to create the “master” checklist file. Displayed above are the contents of a test checklist file I made that has three individual checklists titled BEFORE ENGINE START, ENGINE START and RV-12 POH V-SPEEDS each containing 10 to 12 lines of text. Looking closely the viewer can easily see the format Dynon utilizes for the checklist file. When manually creating the checklist file or editing an existing checklist file, this format MUST be adhered to. As can be seen in the above example each line in the checklist file begins with the checklist number followed by a period ... such as CHKLST1. or CHKLST2. Note: looking at the above photo one can see there is a blank line between each individual checklist inside the checklist file. After the checklist.txt file has been created on the computer of your choice, the “master” checklist file is copied to the root directory (don’t place the checklist file in a folder) of a USB flash drive … which is subsequently plugged into one of the SkyView’s USB ports so it can be loaded into the SkyView. To load the newly created checklist file into the SkyView, enter the Setup Menu by pressing buttons 7& 8 and navigate to Load Files. SETUP MENU > SYSTEM SOFTWARE > LOAD FILES > (select your Checklist file) > LOAD (button) > YES (button) …. If all goes well, you should see a message on the screen saying “Operation Completed Successfully”. 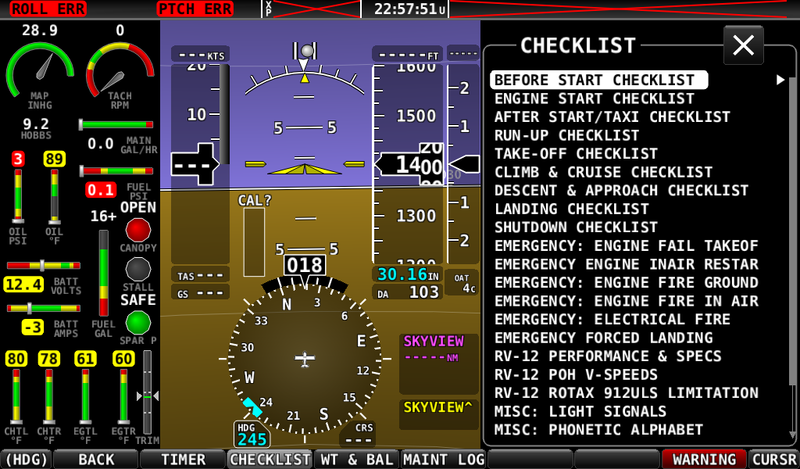 After instillation, the checklists are accessed via the SkyView’s “Tools” page where there is a “Checklist” button. If successful, you should see something along the lines of the photo below after pressing the “Checklist” button. Pressing the “Checklist” button on the “Tools” page will display the checklist menu showing the titles for all the individual checklists that were placed inside the checklist file during the text entry process with the simple text editor. The menu will look similar to the one in this screenshot taken after installing my checklist file ... of course, your checklist titles will be the custom ones you entered when creating the checklist file. Besides requiring a whole lot of typing and attention to detail, it sounds easy right? Actually, it is for those of us familiar with looking at the contents of computer files. However, some users with little or no computer background may find that their eyes glaze over when looking at the contents of a long checklist file and the necessary format within. To Dynon’s credit, an Excel-based spreadsheet creation tool was developed that builds the checklist file automatically for the user … all that is needed is for the user to make text lists on a text editor and then copy and paste the list into the checklist creation tool and when finished, let the creation tool make the “master” file. I’ll cover using Dynon’s checklist creation tool in Part 8.